You may have heard of International Beer day (also BEERHOUSE on Longs birthday) but have you heard about South African National Beer Day? South African National Beer day better know by it’s hashtag #SANBeerday is an excellent excuse to have some delicious craft beer. This day has been decided on by the craft beer community and has been a well supported day around the country. Brewers, taprooms, restaurants and bars are encouraged to do some sort of special promotion or event specially for this day. Will BEERHOUSE rise to the occasion? Naturally. How does BEERHOUSE celebrate? With BOTTOMLESS BEER, of course. 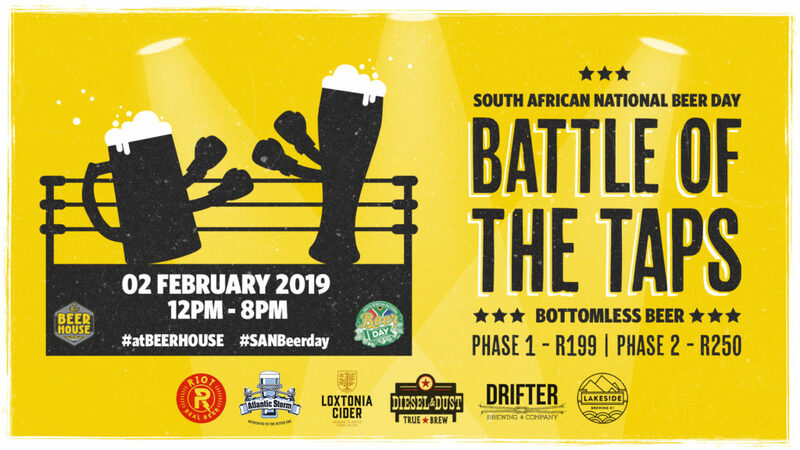 Join us on 2nd February from 12h00 at BEERHOUSE on Long or BEERHOUSE Fourways for our #SANBeer Day: Battle of the Taps competition. We have invited some of SA’s favourite local craft brewers to join us for a mini BOTTOMLESS BEER festival. Grab your tickets online (via Quicket) and you can enjoy 8 hours of BOTTOMLESS BEER. Each ticket holder will receive a #yellow token to vote for their favourite beer on the day. At the end of the festival we will tally the votes and announce the winners. The Beer/Brewery that wins first place will win a 6 month tap on our winter beer menu. Second place will win a 4 month tap and third place will win a 2 month tap. So if you want to drink more of your favourite beer at the festival in the foreseeable future make sure that you cast your vote and rally your fellow beerlovers!